Leave Driving the Brewery Ale Trail to Us – You Sit Back, Sip, Eat and Enjoy Micro-brewing at it’s Best! You are Invited to take The Magic Brew Bus Tour… . All-inclusive Guided Bus Tour from Brewery-to-Brewery with Beer Tastings, Paired Appetizers and even a Behind-the Scenes Trip to learn Micro-Brew Making. Ride with your Expedition Guide – ‘Professor of Brewology’ – on the Brew Bus…safely and in air-conditioned comfort. Leave the driving to us and the sipping, eating and learning to you! Leaves at 3 pm on pre-scheduled weekends. 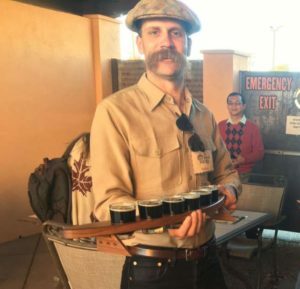 Call or email us for rotating dates … Note: You can plan your own special Brew Bus Tour event on almost any day, afternoon, or evening, by contacting us here. Organize Your Own Magic Brew Bus Tour or Just Hop on Board One Already Planned! Looking for a fun get-together? Organize your own Magic Brew Bus Tour with us ! We can do a Brew Bus Tour with as few as Six and as many as Eighteen ! The 4-Hour Guided-Narrated Brew-Bus ride back and forth between Ashland & Medford’s Best Brew Houses. At least 3 Brewery / Pub Stops and 1- Brew Maker’s – ” See How Micro-Beer is Made ! Walkabout Brewing’s Austrailain-born owner Ross or his staff may take us on a behind-the-scenes tour. Dine on 2- Paired Portions of Appetizers chosen to Compliment the Micro-Brews served. 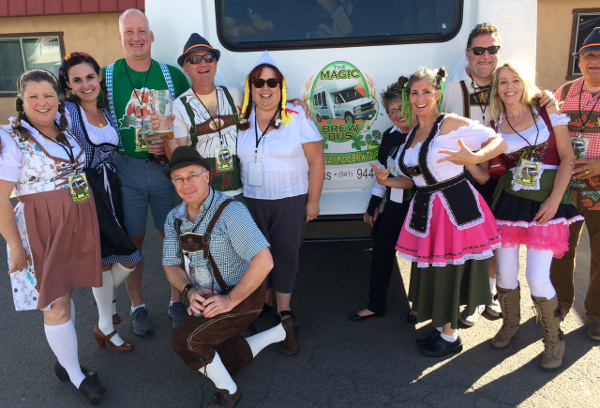 Bay area California guests celebrate a birthday Bavarian style!